Johann Sebastian Joust @ Anime Boston! 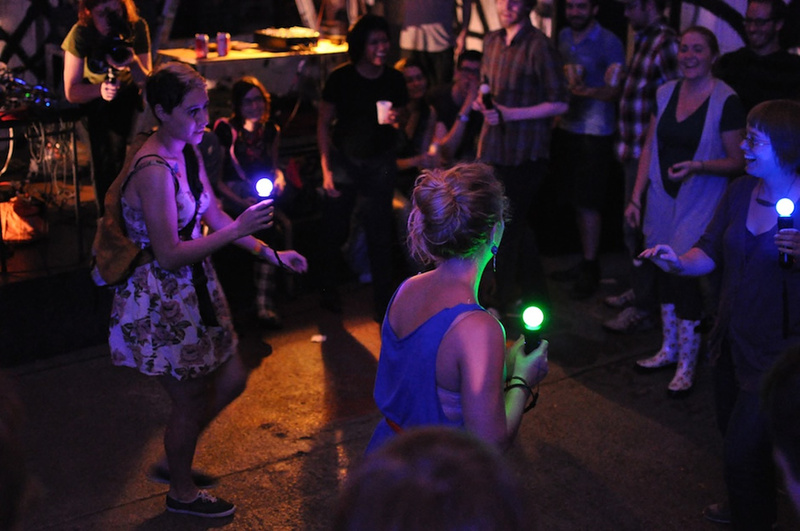 Johann Sebastian Joust is a no-graphics, digitally-enabled playground game for 2 to 7 players, designed for motion controllers such as the PlayStation Move. The goal is to be the last player remaining. When the music — selections from J.S. Bach's ‌‌Brandenburg Concertos — plays in slow-motion, the controllers are extremely sensitive to movement. When the music speeds up, this threshold becomes less strict, giving the players a small window to dash at their opponents. If your controller is ever moved beyond the allowable threshold, you're out! Try to jostle your opponents' controllers while protecting your own. See a video here: http://jsjoust.com/. The game is still in development and won't be out for a while, so this may be your only chance to try this game this year.